When I have been asked that question by friends and family, I’ve usually answered “something that keeps me sane”. 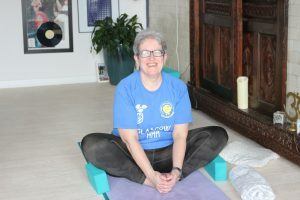 It was only when I started to read the books and literature associated with my teacher training course that I began to identify what it is exactly in this practice which has contributed to my health and wellbeing. The word “yoga” is “a Sanskrit term that comes from the word ‘yuj’ meaning to join, connect, unite… and is related to the English word ‘yoke’ meaning to restrain or harness”. We unite mind and body and unite breath with movement. Yoga is definitely not all about getting the body into difficult positions (asanas)! Yoga also incorporates pranayama (breathing exercises) and meditation. For me, it is the linking of the asana practices with the meditative practices which has been the great revelation: how much calmer and focused I feel after a yoga class. That by realigning the body, the mind can come to the stillness required for meditation. For me, yoga is the realisation of, and the complete embodiment of the body/mind linkage and so, “something to keep me sane”.